I like the space in-between the doorways – it’s dark and eerie, not entirely clear what may maybe contained within. I like how this place feels to me. Full of an anxious anticipation, forgotten (overlooked). 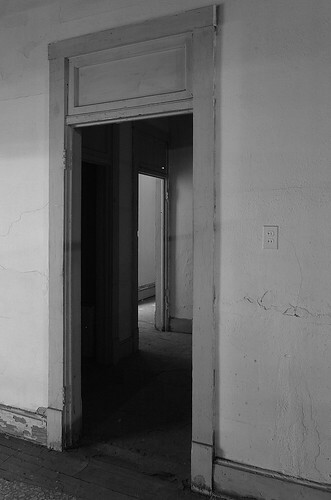 This is where possibilities (my imagination) come into play… Possibly, there is really nothing in that room – and one could get on with it and keep going on to the hallway – presumably. Or, perhaps, there is something in that room – waiting. The picture is about getting from here to there – a prerequisite is to enter this unknown in-between – to find out.